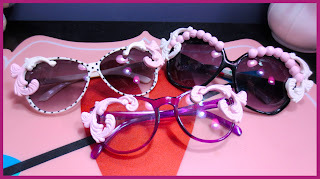 Have you ever seen Moo Piyasombatul's sunglasses? They are absolutely adorable and pricy for a matter of fact. The collection ranges from €370.00 - €415.00!!! For a college gal who is kind of on a budget, that will not do. A couple of days ago I obtained a fondant mold for cake making. I was watching videos and reading blogs and came up with this idea to create the iconic Moo Eyewear. Of course, they not the most absolute high-end quality, but they are inspired by the original. I made them myself and for that I am proud. Follow the instructions as seen in my recent video!